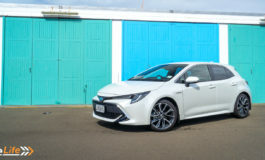 We seem to be on a roll at the moment with a large number of hybrids or EVs coming up for review. Is that good, or is it too early days still? The Prius has been around for what feels like forever, so there’s no evidence for the claims of ‘early adopters’ for those cars. But EVs? That’s a whole new ball game. Sure, the Leaf has been around for a while now, and there are more and more of them being imported. We’ve had the odd new one pop up here and there; the BMW i3, Hyundai Ioniq and Renault Zoe for example. Now with the e-Golf and the Hyundai Kona, people are starting to take notice. 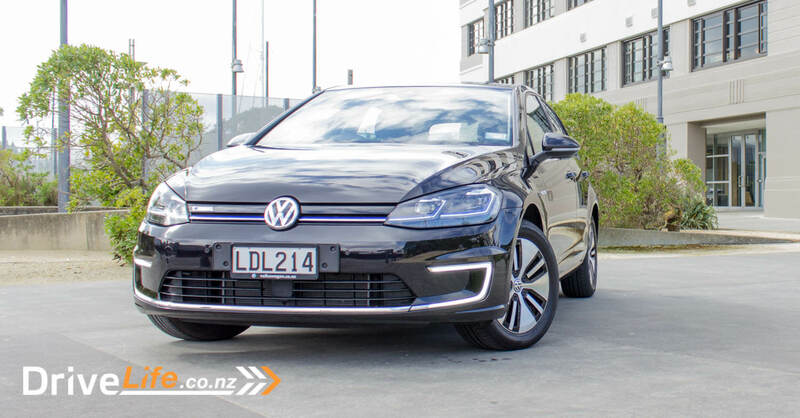 The Golf has always been a respected car in New Zealand, so is it an easy transfer to make, from your petrol Golf to an electric one – especially an electric one that claims to have a 220km range? A week with the e-Golf as my Daily Driver and a couple of longish trips was going to give me the real evidence. Regardless of materials mined to make EV batteries – is it time to sit up and take notice? 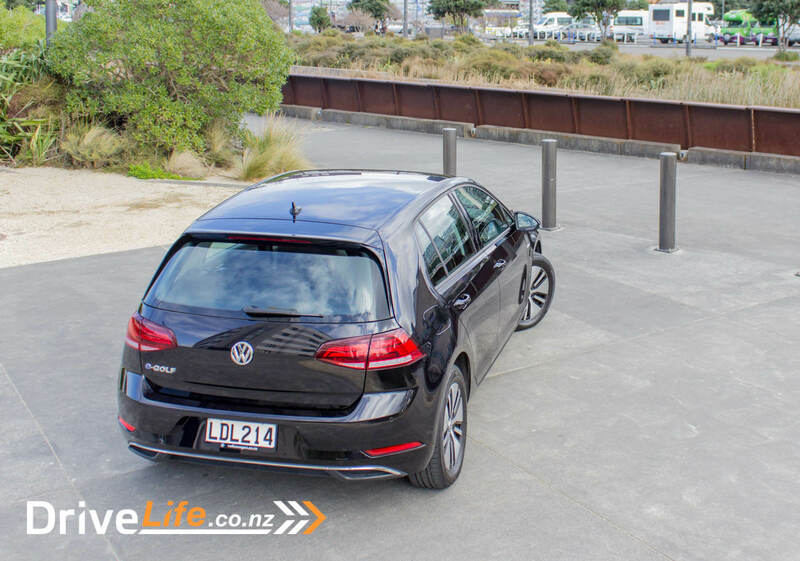 According to VW NZ, the e-Golf has a real-world range of 220km – could it replace my Daily Driver? Well this is going to be short. 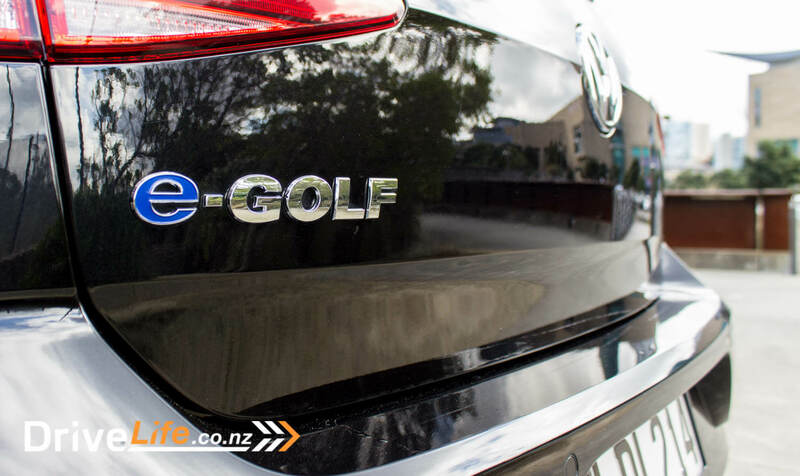 There’s just the one electric Golf model, and it’s simply labelled e-Golf and is priced at $65,990. That’s not to say it’s not fitted out well. 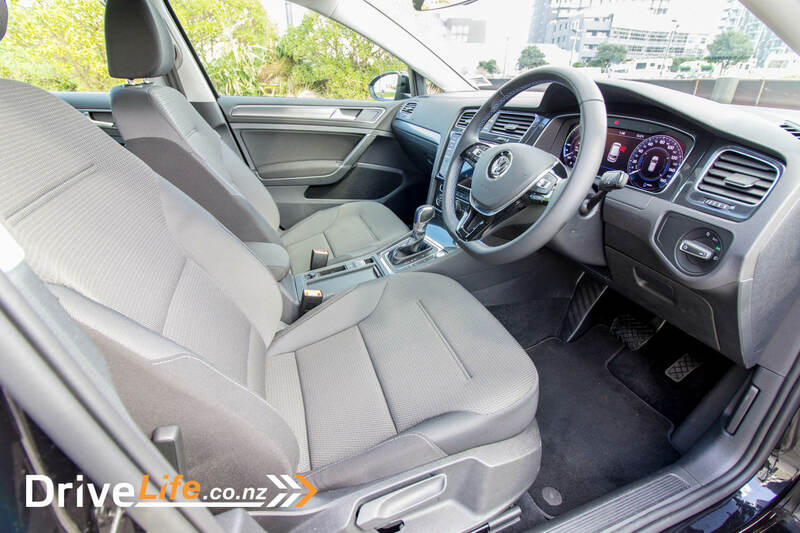 As standard, it does come with an electric park brake with auto-hold, tyre pressure warning system, adaptive cruise control, blind spot monitoring, City Emergency Brake, and the Side Assist Plus package (which includes lane change assist and rear cross traffic alert). 16” alloys are standard, as well as LED headlights, LED DRLs, rear fog lamps, auto headlights, auto wipers, electrically folding and heated mirrors, Park Distance Control (front & rear), reversing camera, 9.2” colour touchscreen with 8 speakers, gesture control, DVD player and hard disk. There’s also Apple CarPlay and android Auto as standard, and a 12.3” Active Info instrument display. A bummer that the e-Golf doesn’t come with heated seats as many other electric vehicles do, that’s a $3,500 option which includes full leather seating. Keep in mind that for the electric side of things, there’s the electric motor in the front of the car driving the front wheels only. Some people assume all electric cars are all-wheel drive. Look, the Golf is normally a great looking car. Why mess with a good thing, right? Uh, yeah. There’s an elephant in the room we need to talk about: those hideous wheels. 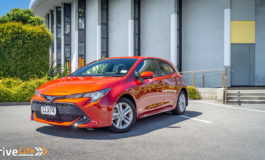 I’m not sure what it is with manufacturers and hybrid/electric cars – they seem to go out of their way to make some part of them (or all of them) ugly. They may be designed for good aerodynamics, but those wheels belong in the 1980s. There’s exceptions to the rule of course, the Tesla is a great looking car, but on the whole there seems to be some agenda to make electric cars look bad/terrible. Case in point: the Hyundai Kona is a great looking car. The EV version? Hideous wheels. Now I’ve got that off my chest, the Golf still looks good if you ignore the wheels, especially in the black our test car was finished in. 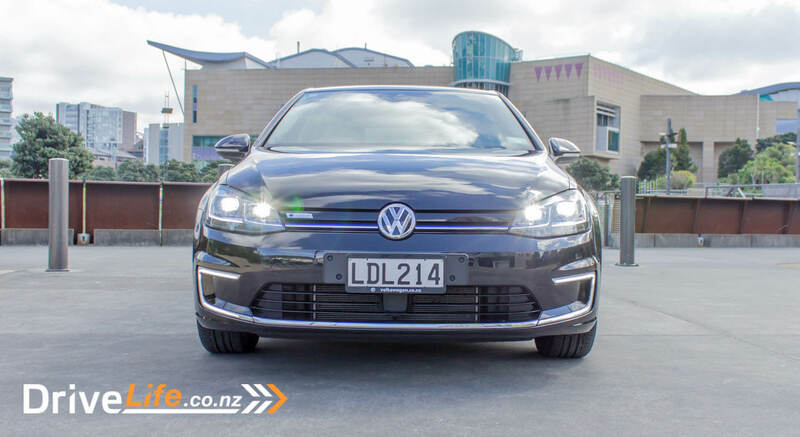 There’s an extra grille bar on the front and e-Golf badges on the front, side and rear but otherwise she’s still a looker. While I’ve moaned about the wheels, it’s time to give VW some credit. Thank you Volkswagen for putting in a standard-looking gear selector. It’s nothing different than what people expect, and I expect that’s how people want it. They don’t want to go trying to figure out some weird looking stick thing (I’m looking at you, Prius) and the one in the e-Golf is perfect. It might as well be hooked up to a normal gearbox, as it also has nice indents and a real ‘mechanical’ feeling when you change ‘gears’. 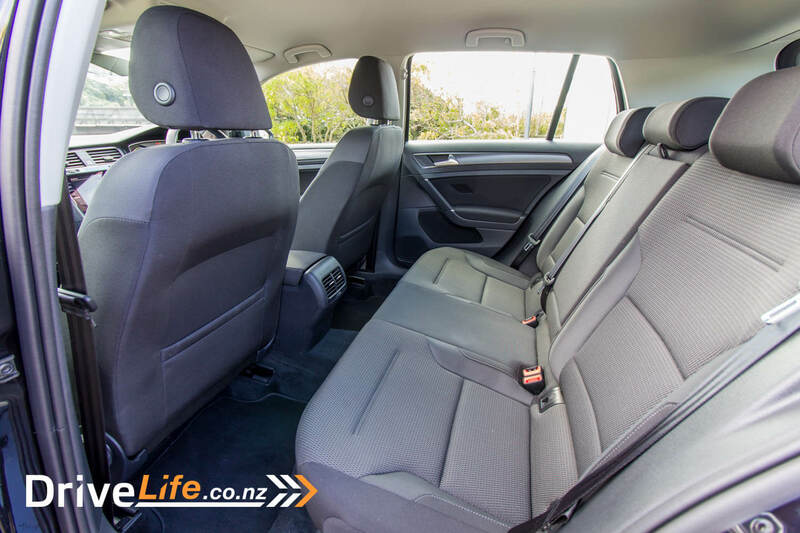 The rest of the interior is standard fare for a Golf; build quality is excellent, and the plastics used also feel like quality items. 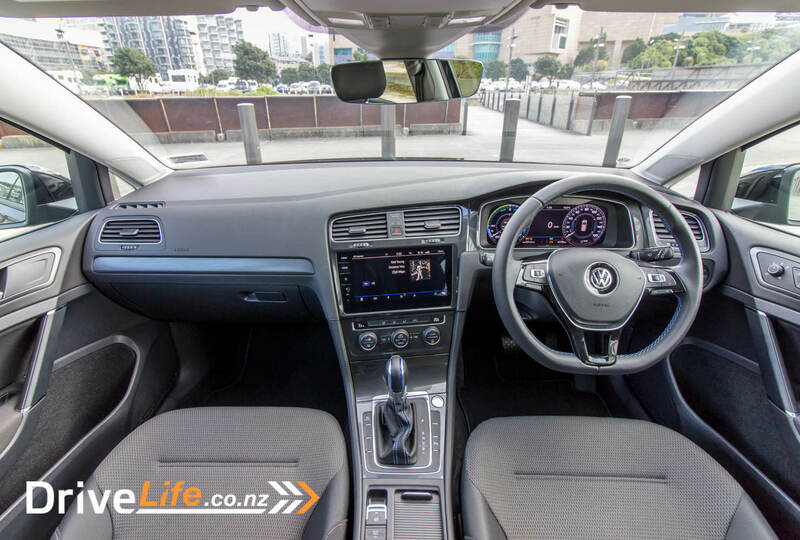 The central touchscreen is crystal clear – fantastic clarity here, and the menu system is still VW’s standard, and works simply and easily – I can’t see anyone having an issue with driving it. Up front, there’s just one USB port and an AUX port. You’d think there’d be more USB ports looking at the target market for buyers, but there isn’t. There’s some blue stitching on the steering wheel and gearshift gaiter, and it looks great. 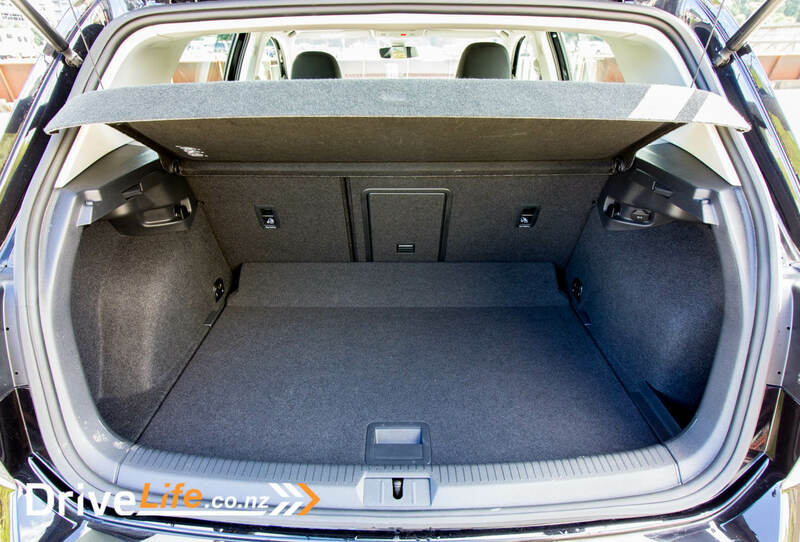 Rear leg room is good too – the batteries for the e-Golf are under the floor, so no sacrifices have been made for interior room. This means the boot is normal size too, which is a bonus. 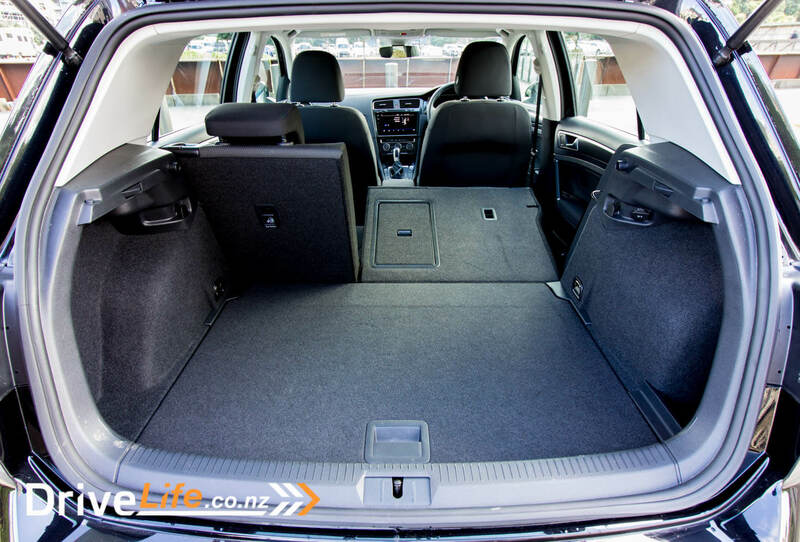 There is a false floor and if it were my car, I’d be tempted to just leave this out of the car all the time and have a deeper boot 24/7, but that’s just me. There’s no spare back there, you get a tyre pump with the car instead. Let’s get straight into the electric side of things, ‘cause that’s what you’re here for. 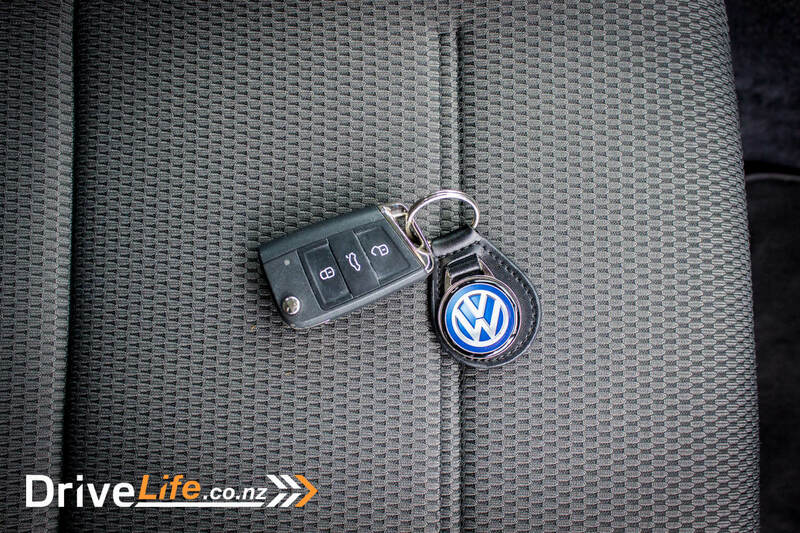 You get three drive modes with the e-Golf: Normal, Eco and Eco+. 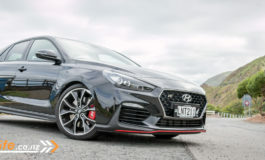 Really, you could consider Normal as Sport mode in a petrol car – this is the mode that gives you the most performance, but obviously drains your battery more quickly. You can still comfortably (re range) use Normal mode if you are just cruising around the city, and know you are going to be charging up that night. In fact, I would. Normal mode gives you that solid ‘instant torque’ feeling, which is great in around-town traffic. Performance is just fine in Normal mode, and while it’s not fast – 100m/h comes up in 9.6 seconds – it’s more than capable. As always with electric cars, it’s the 0-50km/h zone where the car shines, as it leaves those petrol monsters in its silent wake. Eco is a good middle of the road option – you still get reasonable performance and an increase in your range of say 20km when the car is fully charged up. And then there’s Eco+. The warning on the screen when you select this mode says, “Performance and Comfort severely affected”. That’s because you lose control of the air con – even the display showing the temperature goes off (I thought it was broken to start with). And yes, performance becomes a lot more leisurely, to the point where you are speed limited to 95km/h. Well, sort of limited. I found I could drive in Normal or Eco mode and cruise at 100km/h, then switch it to Eco+ and put cruise control on, and it would stay at 100km/h. That was until your speed dropped below 100 because of other traffic, then the adaptive cruise control would set itself down to 95km/h. This all isn’t a bad thing, and if you want to save energy then the e-Golf goes all out to help you. Actually cruising along the motorway silently at 95km/h was just fine for me. I spent a lot of my time with the car driving it in Eco+, just to see how usable it was. Here’s the thing with Eco+ or Eco mode – if you need to, you can just floor it at any time to get full power, so there’s always performance available if you need it. 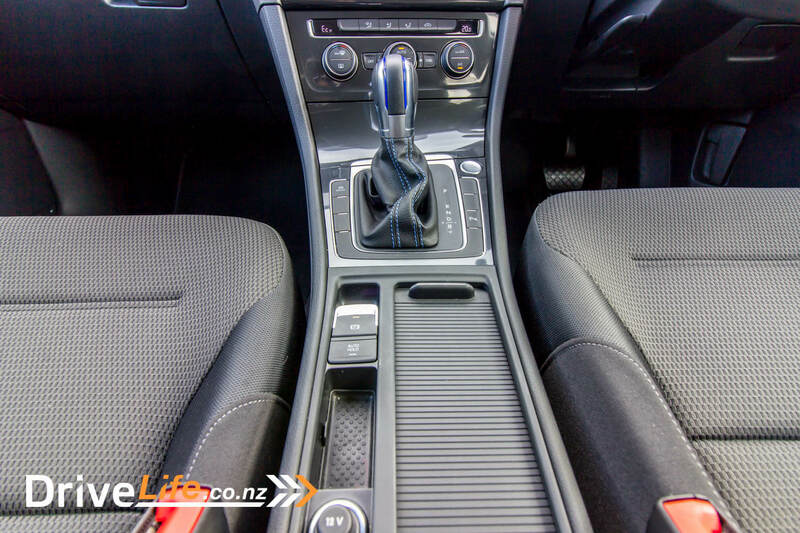 I mentioned the gear selector earlier on, and just how great it was to find a normal looking shifter in the car. 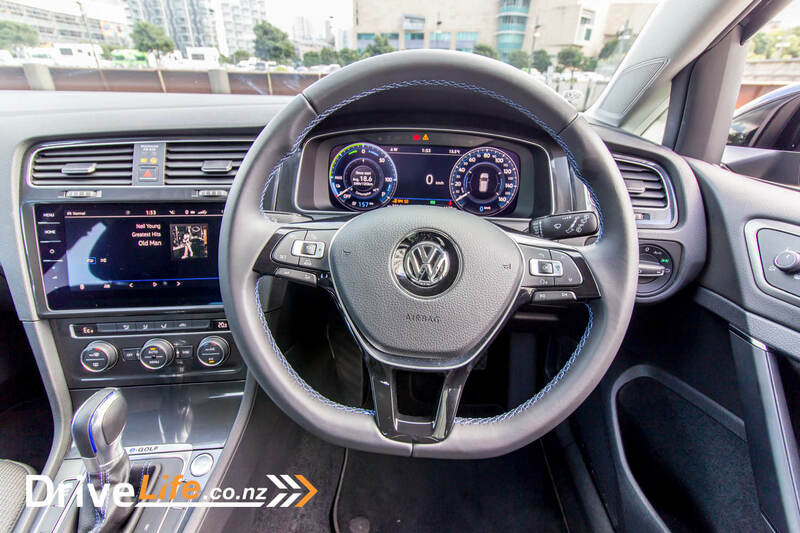 With the e-Golf, you can move the shifter left or right (once you are in Drive) to increase/decrease the amount of engine braking that will be applied while driving. VW calls this Brake Recuperation. There’s 5 levels – None, 1,2,3 and then maximum regenerative braking can be applied by moving the shifter down (where L or 1st would be in a normal car) to ‘B’. This is great as you can determine how much you want the car to give you extra charge, but I would have thought just on 100% or off would have been just fine. Also, it’s a shame that the car doesn’t remember what setting you had it on before when you restart the car. So if you had it on 3, when you restart the car you need to move the gear lever over three times again to set it back. Or, you could just move the lever down to Drive, then a quick flick to B mode – that’s what I always did. I don’t understand the reasoning to want less than maximum charge, as it saves your brakes – you barely use them – and you get the maximum charge back into the batteries possible. So for me, every time I got in the car and started it, I’d move the lever to B. It’d be nice to be able to set this as a default for one of the driver profiles that the e-Golf allows you to pick. The other thing that resets with every start of the car is the drive mode. I’d like to be able to have it always go to Eco mode, for example, but the car always defaults to Normal mode. 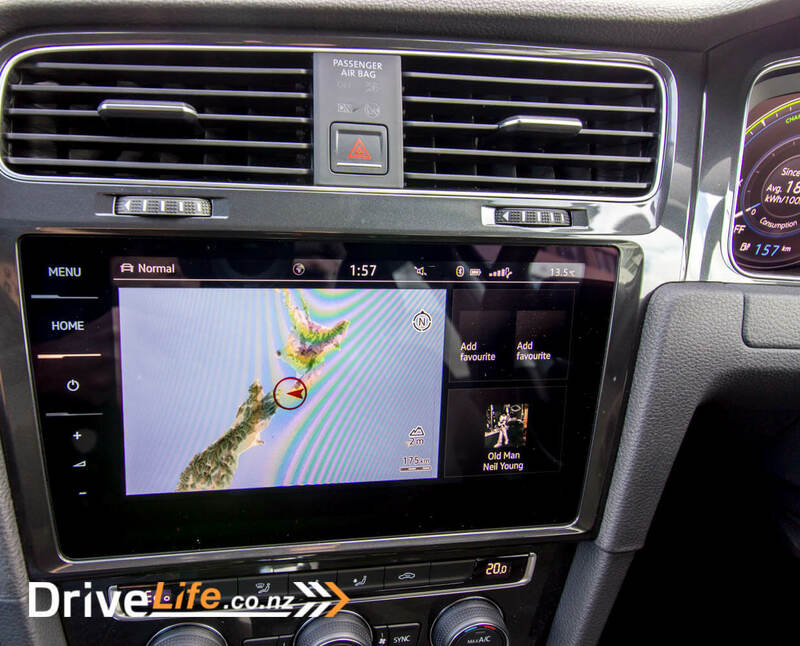 You can download the VW smartphone app, Car-Net, which will allow you to do different things like setup your charging times and have the car heated or cooled at certain times of the day, so quite handy, but it doesn’t look like you can alter any drive mode settings. 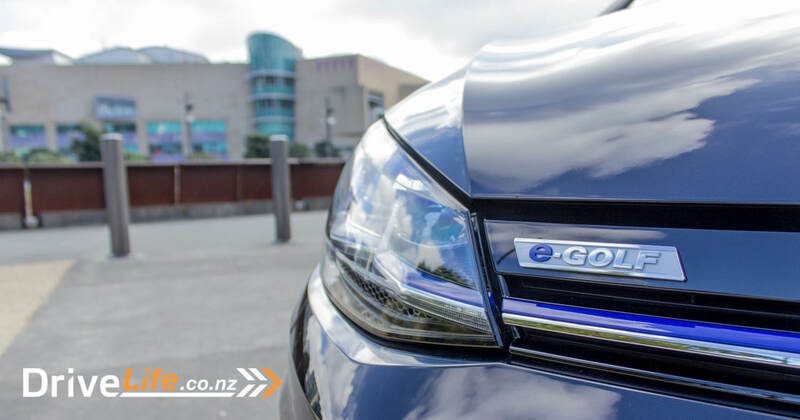 So with a claimed range of 220km, how far can you really go in the e-Golf? First, let’s talk about that 220km range. 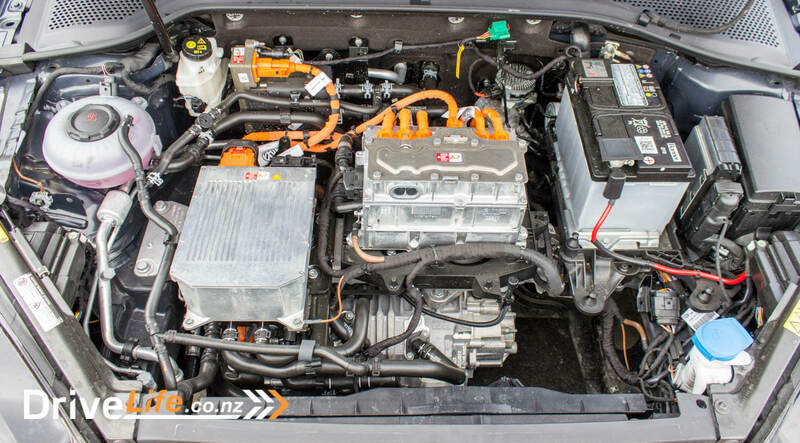 That was achieved by two people from the AA who drove the car (in Normal mode) from Auckland to Tokoroa – 220km – without running out of battery. All credit to VW, that’s a great story and a reflection of the car’s capabilities. But…that is one of the easiest drives in the country. It’s not flat, but it’s not a difficult drive by any stretch of the imagination. There wouldn’t be much changing of the ‘throttle’, and a good chunk of that drive is on the motorway/expressway. I’d be giving it the ‘real world’ test, and when you talk about Wellington’s hills, it’d be as real as it gets. 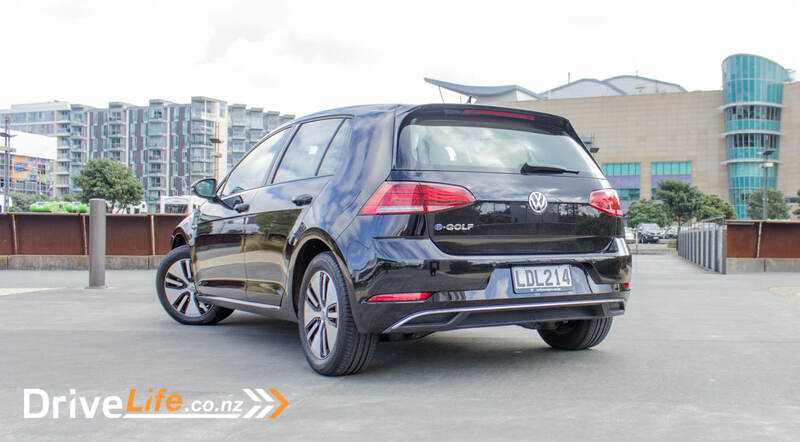 Day Two with the e-Golf, and a trip to Paekakariki loomed. I’d charged up the car overnight, and we had 174km of range when we left home. We don’t have a fast charge outlet at home, so it was a matter of plugging into a normal 230-volt outlet. Anyway, I drove the car in Eco+ mode all the way, and after our 48km drive our range sat on 169km. The maths isn’t hard on this one – we drove 48km and used 5km of range. Things were looking very good indeed. The return trip wasn’t as good, and we used about the same amount of range as we did driving, mainly I’m guessing to a bit of a head wind. Day Three was a trip to the Wairarapa, over that EV killer that is the Remutaka Hill. A solid overnight charge and sticking the car in Eco+ mode, and we had 217km of range leaving the house. We were expecting to do around that much, so – real world test coming up. We drove 90km to Caterton via Martinborough, and had 80km range left. Wasn’t quite going to get home – we might, but we might not. 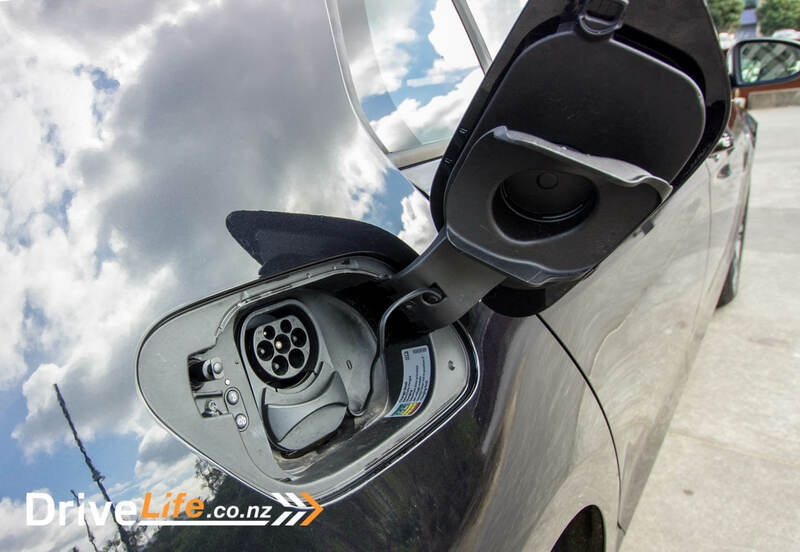 A quick check of the PlugShare app showed that Paua World in Caterton had a charging station. We cruised in and paid our $3, and plugged in. A coffee and lunch in Caterton, and an hour and half later we went back to pick up the car. I didn’t realise Paua World didn’t have a Fast Charger (my fault) and we’d only gained 30km extra range – but it’d be enough. And it was – we got home driving normally (in Eco+ mode, just to be safe) and made it back with 15km to spare. Plenty! I plugged the car back in at home, and away it went. 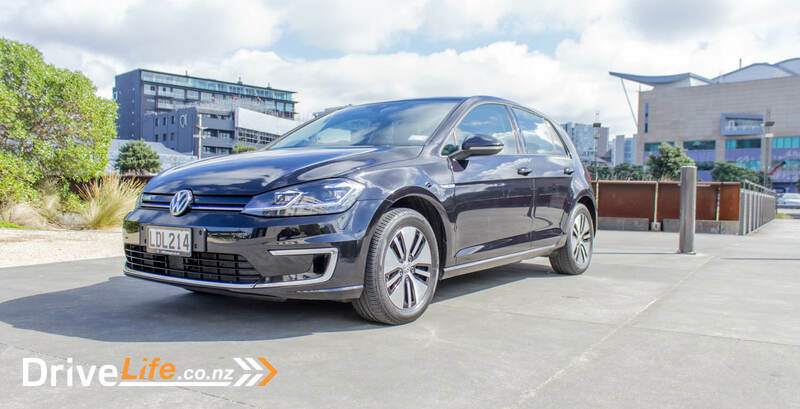 So – you are going to ask how much does it actually cost to charge up the e-Golf? This depends on your power company, and what you pay. I’m with Genesis and the plan I’m on means I pay $0.21/kilowatt. The e-Golf has a 38.5kW battery pack. Let’s say it’s down to 3.5kW of power left, which is almost empty – so you need to put in 35kW of power overnight to completely charge it up. At 21cents/kilowatt, that’s $7.35. You decide if that’s cheap enough for you. From dead flat, if you ever got to that, it would cost $8.09 to ‘fill it up’ based on my power rate. If you were on a power plan that allowed for cheaper charging overnight, then it’s going to cost you even less if you charge the e-Golf (or any electric car/plugin hybrid) at the right time of night. One thing with plugging the e-Golf in – there’s no light in the ‘fuel filler’ area, so it was a matter of getting my phone out to have some light when plugging the cable in at night. It would have been nice to have some sort of light in there (other than the green LED light that shows it’s charging). So enough of the electric driving experience – what about everything else? 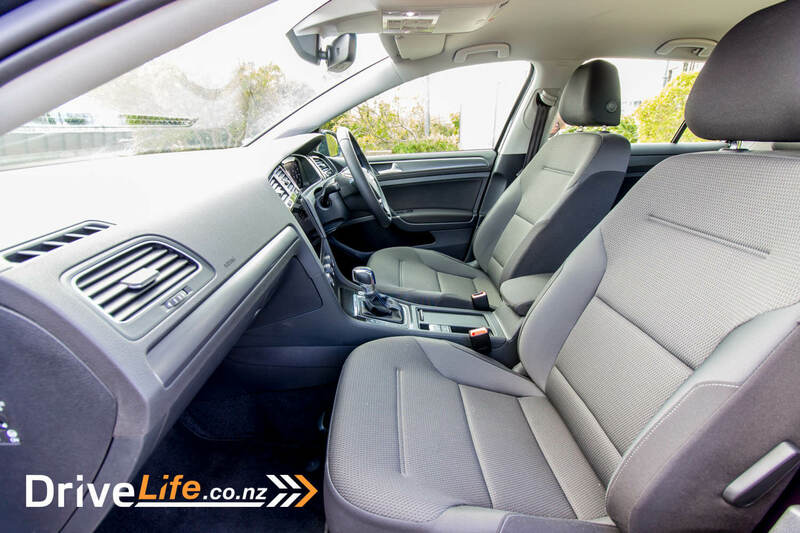 On the down side, the seats are comfortable but do need more side support – it’s easy to slip a bit sideways when pushing on. And again, like some other electric cars, with the batteries down so low, you can really push this car along on the bends. It sits flat, flat, flat. 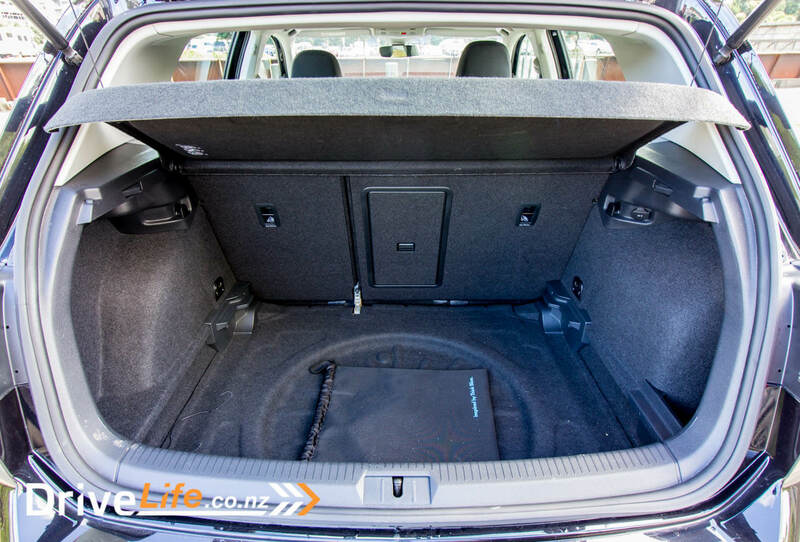 That low centre of gravity is the e-Golf’s friend, and makes it a pleasure to go around corners in, with turn-in being perfect. Ride is one word: excellent. Any bump, any road surface, it rides so well. 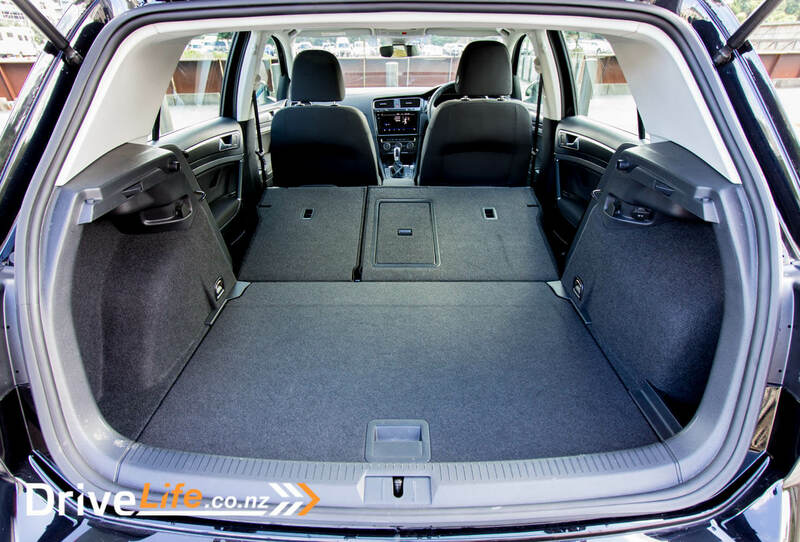 Part of this may be down to its weight of over 1,600kg – on the heavy side for a small car. But it’s one absolute highlight of the car. Still on small niggly things, the Blind Spot Monitoring warning on the mirror glass, and the light on the mirror body that shows the indicator on – they’re too close together. This might be by design, but sometimes an orange light on the mirror would grab my attention and I’d think it was a car as I was changing lanes, but it was only the indicator light warning thing going. The leather steering wheel is small, and feels great under your hands – definitely one of the better ones. Interesting to see that the volume control is on the left side of the wheel, and track up/down is on the right. I’m used to them being on the same side of the wheel, but soon got used to it. 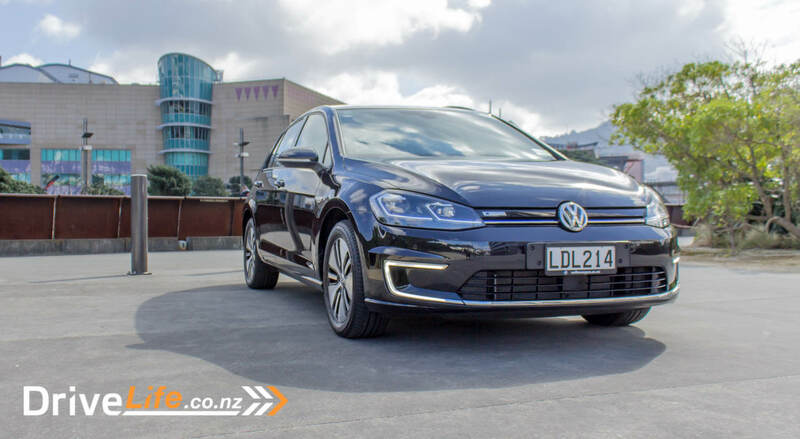 Due to the quietness of no engine, you do hear much more road noise in the e-Golf, but this could be said of most electric cars. Noise in electric cars can also be added from manufacturers putting low-rolling resistance tires on the car, which are made from a super hard compound. There’s some wind noise from the A pillar on the motorway, but on the whole it’s as quiet as you’d expect it to be. Stereo quality is just fine, with some good bass, and separation is above average. There’s gesture control in this car, but as always I simply couldn’t get it to work. That’s more me than the car though, this is something I always struggle with. Well? 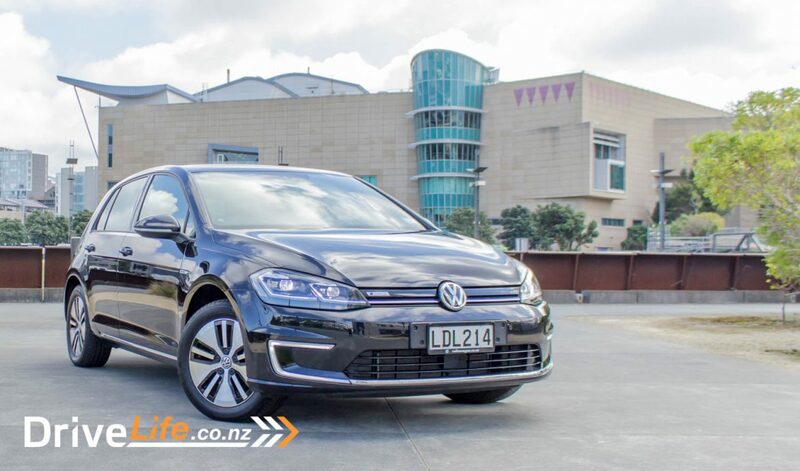 Could the e-Golf replace my Daily Driver? You know, I really think it could. I believe after a short amount of time, your driving style would change and you’d subconsciously drive differently, and get more range without even trying to. I said this of the last car review I did, for the BMW X2: it’s difficult to fault the e-Golf. Ignoring the cost, there are a few small things, but these aren’t deal breakers at all. 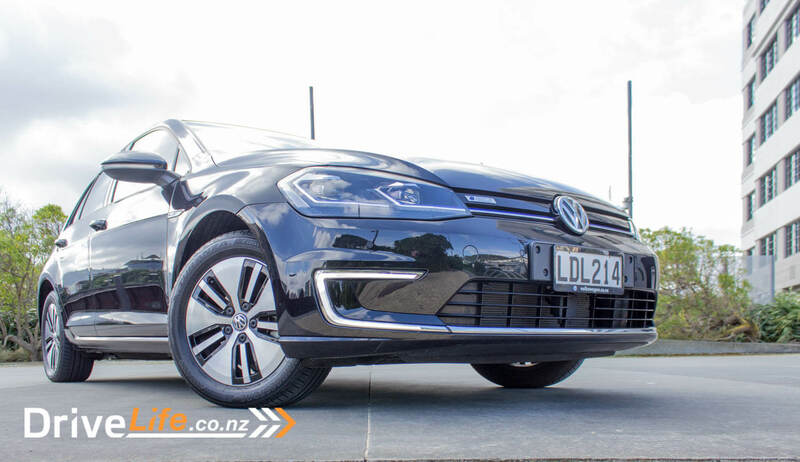 Somehow I doubt any e-Golf buyer would regret their purchase – it’s a great little car.